I think that some of you know the application called GMDesk. This simple add enables access to some Google online services outside the web browser’s window. Instead of it you can use the simple window of GMDesk and work with your favorite online applications separately. The Compass Universal Mail Client is working the same way. 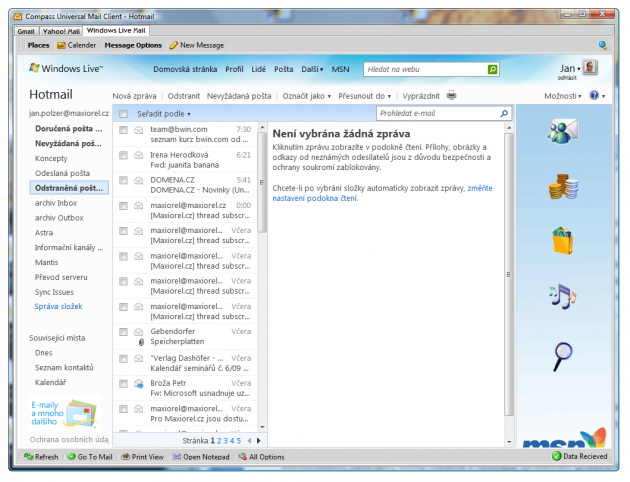 It is very simple but handy Windows application intended for Gmail, Hotmail and Yahoo mailbox users. The Compass uses the Windows Internet Explorer rendering engine, so the login process to your mailbox is done through it with all pros or cons. I decided to try the Compass Universal mail Client with my Hotmail and Gmail mailboxes since I don’t use the Yahoo yet. The first experience is good. As you can see the Compass offers a few buttons to speed up the process of writing the new mail or going to the Windows Live Calendar service. There are other buttons at the bottom. Use them for page refresh, navigation to the message, print preview or opening the Notepad editor. A few options for customizing the Compass are available too. The Compass Universal Mail Client works well with Hotmail, including the new changes for the advertisement banner on the right instead of the top location. But there is a bad news for Gmail users. All buttons (Inbox, Junk, Sent…) don’t work and when you click them they will only initiate the page reload. Only chance to working with the Gmail is using its web based navigation – sure, it is not a big problem. The Compass Universal Mail Client is good idea for software intended to people who use the webmail but don’t like to work with them in the browser’s window. Separate application is much more better I think. The Compass has an useful feature to block the Hotmail advertisement banner. Unfortunately, this ad block doesn’t work with the current version of Hotmail which was changed a few days ago. I hope the developer of Compass will correct this quickly. Let me know, do you prefer Hotmail or Gmail? And why? I see two annoying things for Hotmail – advertisement in each message sent and no chance to select more than one message with Shift and click. However I use the Hotmail for my main e-mails. I like its easy synchronization between web, Windows Mobile phone and computer (Windows Live Mail or Outlook Connector) if needed.